Arlington Theatre - Otter Productions Inc. | Otter Productions Inc. Arlington Theatre - Otter Productions Inc. The beautiful, historic Arlington Theatre in Santa Barbara is the largest movie theater and principal performing arts venue in Santa Barbara, California, USA. 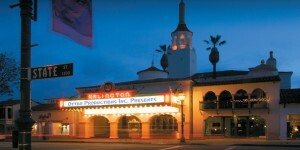 In addition to regular screenings and artists, it is home to many events associated with the annual Santa Barbara International Film Festival. The Arlington was built in 1931 on the former site of the Arlington Hotel, which was destroyed following the 1925 earthquake. The current structure was erected in 1930 as a showcase movie house for Fox West Coast Theaters. It was restored and expanded in the mid-1970s by Metropolitan Theaters Corporation. It opened in its current incarnation in 1976.